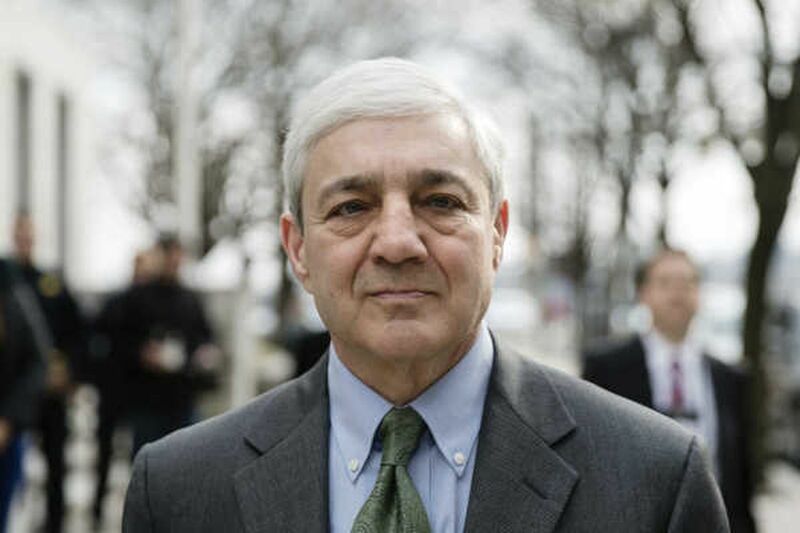 Former Penn State president Graham Spanier was convicted of child endangerment. HARRISBURG -- The foreman of the jury that convicted former Pennsylvania State University president Graham B. Spanier of child endangerment said Thursday that he believes the verdict was a "mistake" and that he was conflicted about not changing his vote and possibly forcing a mistrial. Richard Black, a 78-year-old retired truck driver from Dauphin County, said he was the last holdout at the end of deliberations but has since made peace with the jury's decision last week. Still, Black said that if he saw Spanier today, he'd say: "I'm sorry." He also said he wishes the once-prominent Penn State president had taken the stand and told his side of the story in the Jerry Sandusky scandal. "I don't care how many mistakes you make in a lifetime … you have to reach a point somewhere where you can live with your mistake," Black said. "In this particular case, I can live with it -- even though I feel it was wrong -- because it was an honest endeavor. … Twelve people sat in that room and hammered back and forth, and honestly did what they were asked to do." His comments came during a lengthy interview in the state Capitol, during which Black began by saying he believed the jury's decision was correct but later acknowledged he had deep misgivings about it. It's unclear whether his comments could impact or help Spanier's plans to appeal the verdict. Black didn't describe misconduct by the jury, but instead stuck to his personal views of the evidence in the case. What is more certain: His words are likely to deepen the divide over the split verdict and what it means to the Penn State faithful. After more than a day of deliberations, the Dauphin County panel of seven women and five men last Friday convicted Spanier, 68, of misdemeanor child endangerment for not taking steps to alert child-welfare authorities in 2001 after learning Sandusky had been caught showering with a boy after hours in a campus locker room. The prosecution said several times during the trial that four more victims were sexually assaulted by Sandusky after that 2001 incident. In the interview, Black said that after listening to the testimony and reviewing documentary evidence, he believed Spanier had not been given enough information by his underlings in 2001 to realize the gravity of the incident. "I don't think Graham Spanier knew" that Sandusky had sexually assaulted the boy, he said. "They did not … make him understand how serious a condition this might be." In an interview with the Associated Press earlier this week, another juror, Victoria Navazio, said Spanier's own words in a 2001 email exchange amounted to some of the strongest evidence against him. Only Spanier could have helped clear that up, Black said. Before the trial, sources close to him indicated the longtime Penn State president was eager to take the stand and defend himself. But after less-than-damning testimony from the two men expected to be star witnesses against him -- former athletic director Timothy Curley and vice president Gary Schultz -- Spanier's lawyers chose not to call him and instead argue that the prosecution failed to prove its case. Facing the same felony charges as Spanier, Curley and Schultz cut deals and pleaded guilty to a misdemeanor endangerment count days before Spanier's trial began, and agreed to testify against Spanier. Had Spanier taken the stand, Black said, the jury foreman said he would have remained a holdout during deliberations. "Definitely," Black said when asked whether Spanier's testimony would have led him to hang the jury. "Because even with the way it was, I came that close." A deadlocked jury could have led Judge John Boccabella to declare a mistrial. Spanier's lawyer, Sam Silver, said Thursday he could not comment on the matter. Though the verdict closed the remaining criminal case related to the Sandusky scandal, ​the fallout over who knew what and when at Penn State about Sandusky continues. During his trial, the former university president was surrounded by supporters who have fiercely defended him and his actions since the scandal erupted in late 2011. One of the most outspoken supporters has been Penn State trustee Al Lord, who told the Chronicle of Higher Education in an email this past weekend that he was "running out of sympathy" for "so-called" victims. "Running out of sympathy for 35 yr old, so-called victims with 7 digit net worth," Lord said in the email to the Chronicle on Saturday. "Do not understand why they were so prominent in trial. As you learned, Graham Spanier never knew Sandusky abused anyone."